más Sexist Ads. . Wallpaper and background images in the Feminism club tagged: sexist ads google wife-beating. This Feminism photo might contain periódico, papel, revista, tabloide, trapo, animado, cómic, manga, historieta, anime, and dibujos animados. Who needs to change their behavior? Sexism shall turn tu into a sandwhich! This is a duplicate, BTW. Really? I'm sorry, I didn't know. Geez, I wonder why its only value was 15 cents? this is sick! and vile! 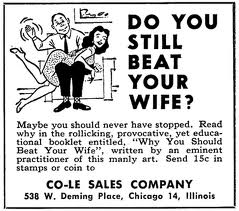 There are reasons to beat your wife. You come home and she is drowning your children. She is attempting to kill you. All valid. ^ If she is doing all that it's probably a good idea not to go near her.